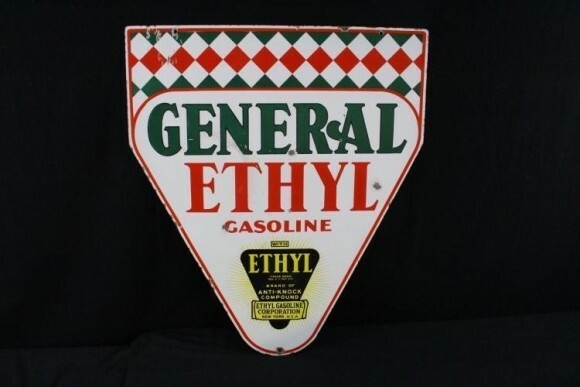 This great looking General Ethyl Gasoline Triangle porcelain sign is double sided and measures 36″ by 42″. The sign is white, but it has a lot of details with various colors. At the squared off top of the triangle is a checkard board pattern that alternates between red, green, and white. Below that in a fancy typeface is text that reads “General Ethyl Gasoline.” The word “General” is written in green, and the last two words are written in red. At the very bottom of the sign is the standard Ethyl triangle logo that appears on so many signs.